For retailers everywhere, the success of the entire year depends on the next two months. The good news is that the future looks brighter than last year although shoppers will still remain extremely price-oriented and a bit reluctant to loosen the strings on their wallets. Jeffrey Grau, an eMarketer analyst and author of the report Online Holiday Sales Forecast: Optimism Is in the Air predicts a growth of 14.3% in online sales over the same period last year which will boost the holiday season sales to $38.5 billion, up from $33.7 billion last year. Retailers will now have the chance to get a lot of new customers and strengthen their relationships with their existing clients by offering rich product information, easy return policies and friendly customer service representatives. According to Grau "This holiday season consumers will open their wallets more than they have the past two years, even though they will remain extremely price-focused. Online consumers have become savvy at finding coupons, comparing prices, locating cheaper product alternatives, and exchanging shopping tactics and information about bargains with peers through social media. WebSitePulse is monitoring ten of the most popular online shopping destinations for the 2010 Holiday Season. The Reports simulate a typical online purchase transaction, like selecting an item, adding it to the shopping cart and checkout, representative for the End Users' interactions with a website. Measurements of the multi-step transactions are made every 15 minutes, simultaneously from 3 different US cities. The reporting period covers the dates between November 22, 2010 and January 5, 2011. 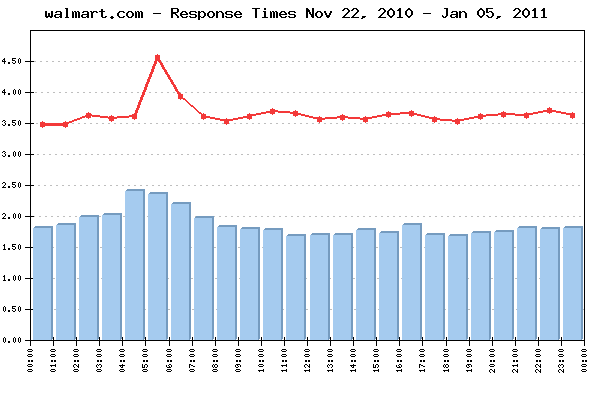 The daily Average Response time from all monitored websites was 3.662 sec. The Average Response time as measured from the US East Coast (Los Angelis, CA) was: 4.808 sec. The Average Response time as measured from the US West Coast (Washigton, DC) was: 2.867 sec. 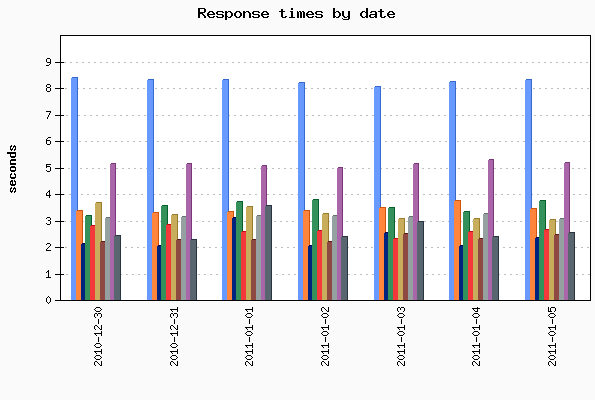 The Average Response time as measured from US Central (Chicago, IL) was: 3.311 sec. The Best Response time measured from US East Coast: 2.656 sec. The Best Response time measured from US West Coast: 1.739 sec. The Best Response time measured from US Central: 2.071 sec. 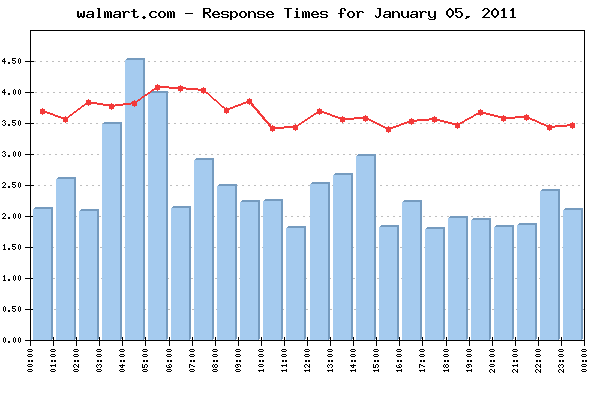 The typical shopping transaction took the least time for circuitcity.com visitors - 2.323 sec., while the visitors of amazon.com had to be the most patient, as the shopping transaction there took in average of 8.312 sec. The daily average uptime for the entire Group was 99.91%. No events of particular importance or possible negative impact on the online visitors' interaction with the Websites included into the 2010 Holiday Season report were detected during the reported period, and according to WebSitePulse, the Group delivered the expected levels of End-User experience and Customer satisfaction. The 2010 Holiday Season Reports reflect a complete web transaction, representative for the End Users' interactions with a website. The reporting period covers the dates between November 22, 2010 and January 5, 2011. Performance and availability measurements are made for a typical multi-step web transaction at 15 minute monitoring interval, every day 24/7. The WebSitePulse application monitoring service is used to collect data and to create the reports.